My best friend of almost five years proposed to me on Monday, March 11, 2013. I met Dave Whitley in 3D Design and Painting 1 in August 2008. They were at 8:00 and 11:00. Of course I was the one that started the conversation, because I saw that we were gonna have the same schedule for 6 straight hours twice a week, and I just liked making friends in school! He was shy, not very talkative, nerdy, but REALLY talented. He put up with all my jokes and we started helping each other out in school with projects. We walked to the Union in between 3D and Painting to eat lunch. I brought a turkey sandwich and got Starbucks coffee. He got the same thing from Chic-Fil-A every single time – Grilled chicken sandwich with mustard, fries, and sweet tea. In the Spring, we (along with a bunch of new friends) started to plan to take all the same classes together. I knew he was really good and I wanted to learn from him. The summer of 2009, my grandfather died. Dave was there for me while I was going through one of the hardest times of my life. That summer he became my best friend. Clever, right? I first thought this was a mean joke from Tim. (Tim’s been teasing me for months on when we were gonna get engaged!) Then Dave reaches for his pocket then gets down on one knee. He asked me to marry him and I’m still a little in shock. Of course I said YES! And I never gave him any pictures or descriptions about a ring. But he picked out the most gorgeous antique 1920s Art Deco ring that I just love. And the thing I love the most about it is that he picked it out and knew what I would like. The past year and a half has been filled with so much joy. I am thankful every single day for this man. I love him more everyday. I’m so thankful we have been in each other’s lives for SO long now. I can’t imagine my life without him. And I don’t want to! He is so wonderful to me. He brings me incalculable joy. I can’t wait to marry him. I am looking so forward to all of our friends and family to share in our wedding day. 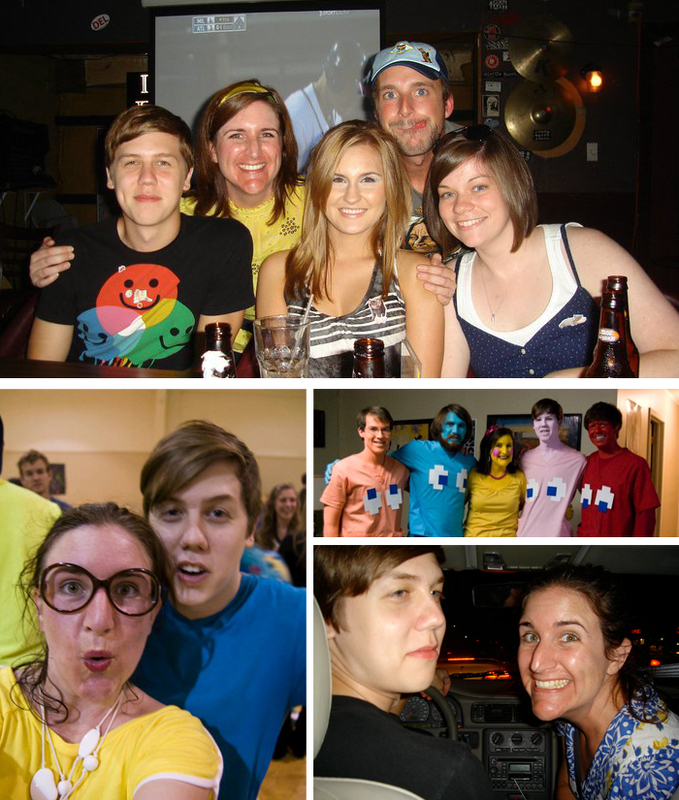 Below are just a few pictures of the hundreds we have together from school and just a few of us dating. Our wedding website is not done yet. But when it is, I will be sure to let you know. (I’m marrying one heck of a web designer. Wedding bloggers are gonna be all over that! HA!) Oh! And yes, those are our two cats in the Save the Date (Eric and Weezie). AND the cutest thing – Weezie Thomas is going to become WEEZIE WHITLEY! oh. my. word. I actually had the idea for the Save-the-Dates almost a year ago. I have not fantasized about my dress or flowers, but don’t think for one second I haven’t given A LOT of thought what our invites would look like! Obviously it’s the most important thing to us. All I can say is, LOVE LOVE LOVE. You two are so wonderful together, and I love hearing your story! Kate! I’m so excited for the two of you! Thanks for telling the whole story. I love it! Kate, what a beautiful story. I am still smiling! So special! Thank you so much, Mrs. Marsha!!! 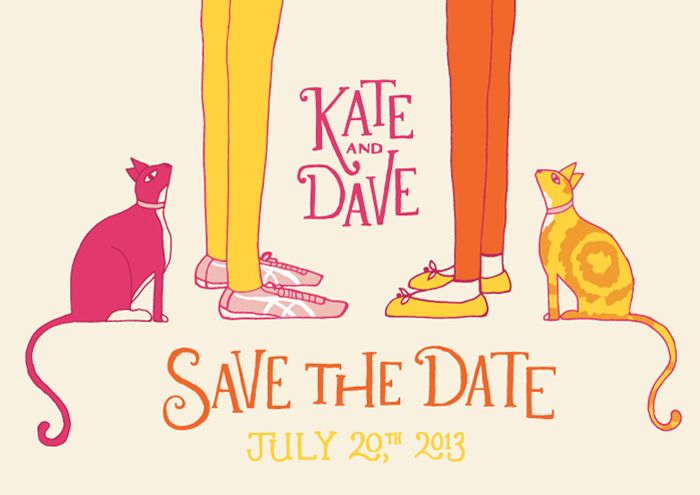 Kate, I’m so happy for you and Dave! Love your sweet story! We met exactly the same way – first day of class, me overtalkative, Kevin, nerdy and quite – the rest is history! This summer is our twentieth from that moment. The best. I wish you two the same!!! Love always. You were always one of my fav students and Dave had scary amounts of talent!